When I was younger, Updates would happen and I would be none the wiser. The update would be like a foreign language because I had no reference to understand. I have gotten a bit better at sorting through and figuring out what matters to me. Now when Update 6 was released, it changed virtues and traits (Update-6-relics-and-virtues) and changed RKs significantly. I totally intend to explain those changes because it was really important and lots of people discuss (complain) about upcoming changes without revisiting the subject with actual data evaluation after they play it. Rest assured, I have data to show the RK changes of U6. J However, I won’t post-mortem dissect U6 today. Today, I want to look at Update 7 that is coming down the pike next. The way I read these Updates, I mentally classify changes as words (typos and such), minor fixes that to have things work like intended, and real changes that matter. The entire release is an interesting read. I picked through it to note some of the most interesting things. If you want to read the entire thing (or are interested in classes other than RKs), CasualstrolltoMordor has a nice PFD right here (Update-7-bullroarer-release-notes). Because there are too many words on this page and not enough pictures, here is a shot of the Stangard steed. For the low low price of 20 gold Anduin tokens, it can be yours also (Less-math-more-ponies). 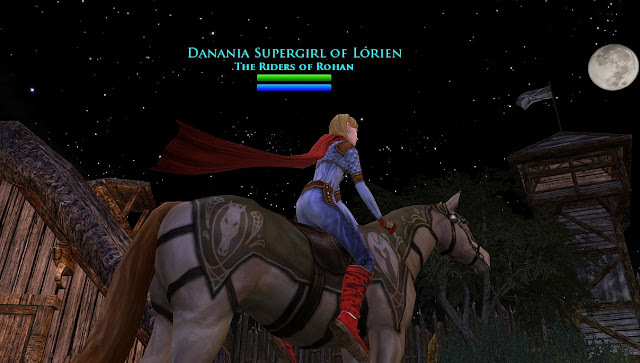 My next targeted steed is probably the Isengard Warhorse... we shall see how much longer that takes to save up the 99 Orthanc sigil fragments. "Fields of Fornost in North Downs gets a revamp, instance panel, group play level 30 – 75." *Haven’t been there in ages. "Moria gets a revision." *No new quests or consequence of interest at level 75. "Storm on Methedras New Skirmish." *Will need to add it to skirmish table. (Fastest-skirmishes-marks-per-minute). Hopefully, it will be super and give reasonable marks for its length. "Relic change: Tactical Mastery was added to the Westfold Rune of Power and the Great River Rune of Power." *See Update-6-relics-and-virtues - previously, it boosted Fate, Physical Mitigation (defense), and Physical Mastery (useful for non-tactical classes) and was inappropriate for a tactical class. I still probably won’t give up the “True Rune of the Two Trees” though. "The Jester horse jingle, jangle sound is now playing on the sound effects channel and not all channels." 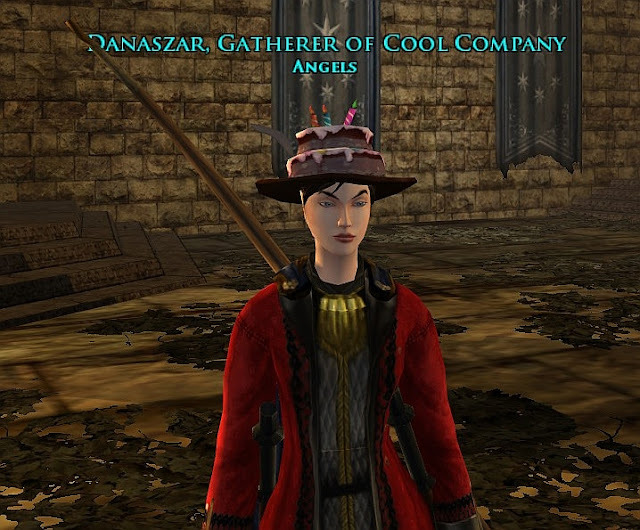 * <06/01 EDIT: That horse has been located at Spring Festival; see him here @ Danania's Steed of the Jester >. Photo break... It was a great Anniversary party. Danaszar, in party hat, bids you all Auf Wiedersehen until the next festival... which might not be that far away since Spring is here and we aren't yet spring festing. The released doc lists 17 changes to RK. 11 of them are just words, typos, and tooltips. They have no bearing on how a RK feels. Essence of Storm no longer increments Winter-storm on a critical hit. Winter-storm is no longer expended by an attack that is resisted or misses. Adjusted the trait set bonus for Calming Verse to boost movement speed +20% to match the tip. Fixed a bug where the Rune-Keeper skill “Ceaseless Argument” was not receiving the appropriate damage increase from the Legacy. The lack of Calming Verse speed buff was annoying when first spotted with Update 6, but it looks like it is fixed currently even before Update 7 (at least most of the time). These five are not a big deal since they are revising to work “as intended”. Ceaseless Argument legacy is the only other one that is easy to spot as the Legacy will now be able to add +15% damage at maximum. 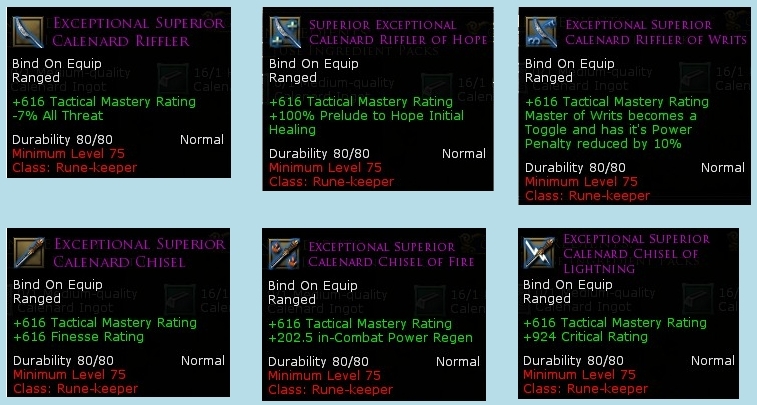 All Riffler of Writs class items should now grant increased Tactical Mastery, a reduction to Writ power cost, and the ability to nullify attunement shift while the Rune-keeper is attuned. I had to go look up Riffler of Writs at the metalsmith since I don't use that one. 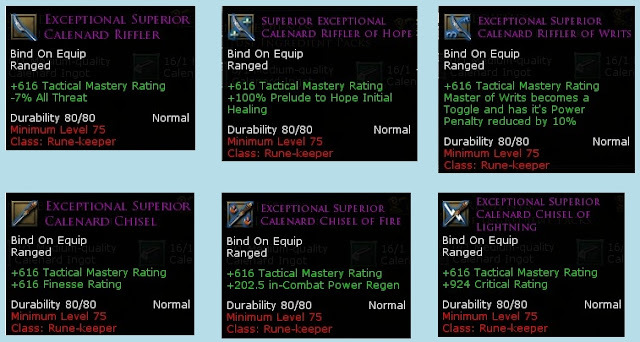 So to recap, the new version has Tactical Mastery (all rifflers and chisels do), reduction of Writ power cost (if you are running out of power, we need to figure out why… this riffler probably isn’t the solution), and it has the ability to nullify attunement shift when casting writs. Yep, that is what it is supposed to do. It must also be a fix and not a real change. Danadelion sends a copy of all of the level 75 rifflers and chisels available for us to review, with the mention that any decent metalsmith can make these and are relatively inexpensive. So, don't get suckered into overpaying for something so easy to craft and so necessary for your RK-ness. I will stick with the "Exceptional Superior Calenard Chisel of Lightning". It's simple, effective, and super. There is never a reason to change from it. Welcome to the NBI! Have fun and let us know how we can help! Thanks for the post. Very informative for the rk changes. I wish I still played mine :(. You might be back eventually. :) For those who don't know, I have a photo file called "Ragnarokr Feb 6 2012" I was using as one of the benchmarks for building the model RK and the ideas I learned dot this blog (especially in the math and gear sections).